08-N7Q system, Immensea region. 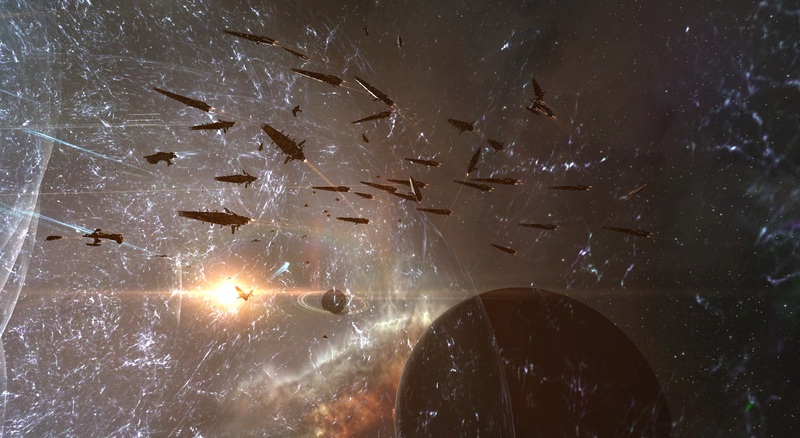 On the 15th of February at 18:06 EVE Standard Time, a battle unfolded in the system between Vanguard (VG) coalition and Phoenix Federation (PF) coalition forces. PF had a 70 pilot Sleipnir command ship fleet in the system reinforcing structures alongside a squadron of carriers. Two Raitaru engineering complexes which belonged to a former corporation of Fidelas Constans [FCON], a member alliance of PF, had remained behind in the system and the force was attempting to reinforce them so they could be destroyed on a later date. In order to do this efficiently, the force split; the Sleipnir fleet reinforced one structure while the carrier squadron reinforced the other. This however did not escape the notice of VG scouts who relayed the information and subsequent timers to their fleet commanders. Deciding to drop on the force, VG forces prepared a 100 pilot Tengu strategic cruiser fleet with 2 capital squadrons. The capital squadrons contained a mix of dreadnoughts and combat carriers, with a few Minokawa force auxiliaries for support. The fleet had moved the capitals in range of the system as well as prepared a titan in range. Once the PF fleet and the combat carriers were spotted again, bashing the structures, VG sprang into action. A neutral interdictors was brought into the system, equipped with a probe launcher. The destroyer deployed combat probes and scanned down the combat carriers, warping on top of one and launching warp disruption probes upon landing. The warp disruption probes snagged the carrier force, allowing the interdictor to light a cynosural beacon. Through the cynosural beacon jumped a Chimera combat carrier. The combat carrier had been equipped with its own cynosural beacon, VG fleet commanders trusting the more robust shields of the Chimera to allow the fleet to bridge in without disruption. This was indeed what happened, as the Tengu fleet materialized on the field, followed by its two capital squadrons. Dreadnoughts entered siege cycles as combat carriers launched fighter squadrons. The Tengu fleet anchored up, its interdictors working to supply secondary tackle on the combat carriers that found themselves under fire from the VG fleet. The Sleipnir fleet reacted to this development and warped to its distressed capitals, landing a short distance from the strategic cruisers. Both sides started exchanging fire, the Tengu fleet keeping the engagement at close range. First to be targeted were the support ships of Sleipnir fleet. The Tengu fleet loaded its railguns with short range, high damage ammo and had no difficulty in volleying the relatively fragile ships. At the same time, the VG capitals started to hammer the PF combat carriers, destroying a couple in the opening barrages. The Sleipnir fleet attempted to return fire, destroying a VG logistics cruiser but soon found itself unable to apply damage well. With its support ships gone and having to fight at close range, the Sleipnirs’ artillery cannons were unable to properly track the fast strategic cruisers. Instead, the fleet focused on removing tackle from the field in the hopes of freeing some of its tackled carriers. Though losing a few interdictors and even a heavy interdictor, the VG fleet had no trouble keeping the majority of the PF combat carriers tackled. With the help of the capitals, the Tengu fleet burnt through the combat carriers, destroying all of them save one which managed to escape. With the combat carriers gone, the Tengu fleet and its capitals shifted their focus to the command ships. The battlecruiser hulls came under heavy fire, caving in in rapid succession as railgun, fighter and capital turret munitions poured down on them. With the combat carriers destroyed and suffering heavy casualties, the Sleipnir fleet attempted to disengage. Surviving ships attempted to clear a path out of the cover of warp disruption probes and warp out. Many were snagged by the tackle wing of the Tengu fleet, leading to their inevitable demise. Those that made it, retreated, leaving the field in the hands of VG. VG in turn cleared the grid of stragglers and started looting the field while extracting its capitals. With the field picked clean and the capitals safe, the Tengu fleet departed, bringing an end to the fight. Battle report for the 08-N7Q system can be found here. All told the battle lasted 10 minutes with Time Dilation not reported and the system hosting 205 players at the height of the fight. PF lost 52 ships in the fight, including 6 combat carriers, 9 command ships and 23 battlecruisers for a total of 30.27 billion ISK damage. VG lost only 7 ships, mainly interdictors for a total of 1.41 billion ISK damage. Hiya, I’m really glad I’ve found this info. Nowadays bloggers publish just about gossips and net and this is actually irritating. A good website with interesting content, this is what I need. Thank you for keeping this web site, I’ll be visiting it. Do you do newsletters? Can’t find it. It¡¦s in point of fact a nice and useful piece of info. I¡¦m glad that you just shared this helpful info with us. Please keep us informed like this. Thank you for sharing. I¡¦ve been exploring for a little for any high quality articles or weblog posts on this sort of house . Exploring in Yahoo I finally stumbled upon this site. Reading this info So i am happy to show that I have a very good uncanny feeling I discovered just what I needed. I such a lot no doubt will make sure to do not omit this site and give it a glance regularly. Thank you a lot for giving everyone an extremely wonderful chance to check tips from here. It is always very great and also jam-packed with a good time for me and my office mates to search your site at the very least thrice a week to read through the latest issues you will have. Of course, I am also always astounded with all the great secrets you give. Certain 1 points in this post are easily the most beneficial we have had. Thank you a bunch for sharing this with all of us you actually understand what you’re talking approximately! Bookmarked. Kindly also visit my web site =). We may have a link trade agreement among us! Hello There. I discovered your blog the usage of msn. That is a really well written article. I will make sure to bookmark it and come back to learn extra of your helpful info. Thank you for the post. I’ll definitely return. Just wish to share something. I need to send my blog sites to blog site websites with a lot of individuals reviewing blog sites. That’s what I require a lot of. Thanks for sharing excellent informations. Your site is so cool. I’m impressed by the details that you¡¦ve on this blog. It reveals how nicely you perceive this subject. Bookmarked this website page, will come back for extra articles. You, my friend, ROCK! I found just the information I already searched all over the place and just couldn’t come across. What a great website. I have seen a lot of blog sites in blogspot. What purpose do they offer? Is it feasible to generate income via blog sites. If yes exactly how?. azUTti It is appropriate time to make some plans for the future and it as time to be happy. I have been a yahoo individuals for some years now. I am just starting to take advantage of the devices which they supply, among which being blog posts. I have actually composed a blog as well as wishes to understand if my article are being seen by others. Otherwise then does any individual understand exactly how I get my articles check out. Is it true that blog sites are just forum discussions with rss that would certainly enable the individual to view what they wished to watch even more convieniently? Is that all the differences?. Hello would you mind letting me know which web host you’re using? I’ve loaded your blog in 3 different web browsers and I must say this blog loads a lot quicker then most. Can you suggest a good hosting provider at a reasonable price? Thanks a lot, I appreciate it! This website online is mostly a stroll-via for the entire information you needed about this and didn’t know who to ask. Glimpse right here, and also you’ll positively discover it.